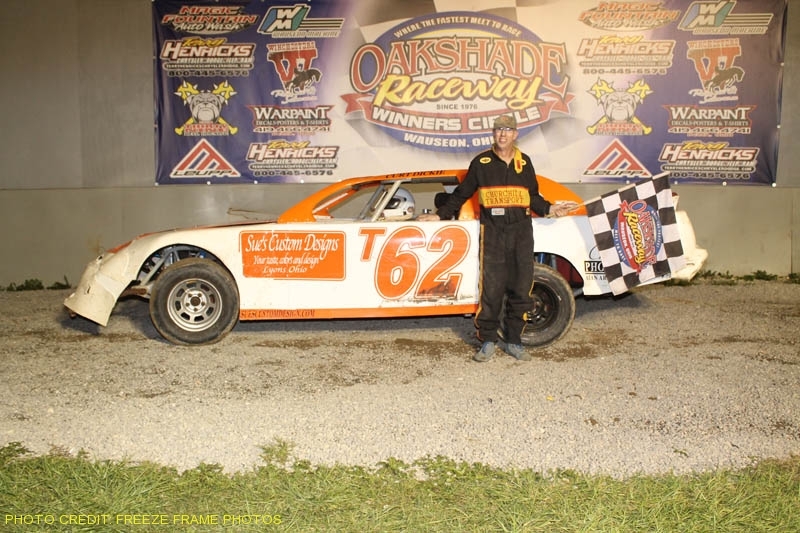 Sylvania Ohio’s Casey Noonan meticulously worked through slower traffic to earn the American Late Model Series $2000 Feature win at Oakshade Raceway Saturday night. Ky Harper began the night five points behind Jon Henry in the ALMS points standings and started on the pole of the feature alongside Casey Noonan. The two drivers battled early for the lead in the 30-lap event. The defending Oakshade Late Model track champion, Rody Schroyer, transferred into the feature after winning one of the two consolation races. Schroyer feel off the pace running at the tail of the field as the leaders were approaching. That held up Harper and Noonan took advantage, slipping under Harper as he had to check up for Schroyer. Noonan began to open up his lead as the race continued without any cautions with the exception of an incident on the first lap that resulted in a complete restart. Noonan seemed calm and collected as he navigated through the lapped traffic he encountered while trying to maintain his lead. Jon Henry got by Harper for second after those two raced side by side for many laps. Jon Henry, from Ada, Ohio, began to slowly close on Noonan in the final laps but was too far behind to catch him. Casey Noonan drove his Noonan Performance Racing Engines & Dyno Service Late Model to his first victory of the year. Henry maintained his ALMS points lead with a second place finish with Harper hanging on to finish third. Brian Ruhlman came in to the night third in ALMS points behind Harper and Henry and finished fourth in the race ahead of Rick Delong. Brett Miller made a bold move on the first lap of the UMP Sportsman Feature going three wide between Rob Liaeff and Joe Derbeck for the lead. Brian Fisher closed in on Miller and got to the inside of him by lap eight. The two drivers battled for a few laps with Brian Fisher taking of the lead by a nose on lap 10. Fisher maintained his lead the remainder of the race on his way to his second feature win of the year despite a late charge by Miller. Miller, with one feature win a few weeks ago, settled for a second place finish. Matt Lindsey, Tim Line and Rob Liaeff rounded out the rest of the top five finishers. The start of the UMP Bomber A Main featured some great three wide racing action for the lead among Jim Scout, Dustin Sautter and Jerry Signor. The battle for the lead then continued side by side between Scout and Signor after they disposed of Sautter and remained tight most of the race. The slight advantage for the lead belonged to Scout for most of the race, but Signor from Jackson, Michigan dropped to the inside of Scout with just two laps remaining and stole the lead away. Signor went on to pick up his second consecutive UMP Bomber A Main Feature win. Scout finished in the runner up position followed by Curt Lancaster, Ron Tolles and Billy Brown. Fifteen-year-old Dylan Herman led the UMP Hornet Feature from flag to flag to earn his second feature win of the year. Things got ugly on lap two as Drew Smith, Adam Noonan and Derek Morris spun coming off turn two. Morris’ car ended up stopped facing oncoming traffic right in the groove. Bill Reeves Jr. who was running near the tail of the field rammed head on into Morris after the caution flag had flown putting an end to both drivers’ night. Finishing second behind Herman was Drew Smith who has finished second in every UMP Hornet Feature so far this year. Gabe Mueller took third followed by last week’s winner Adam Noonan. Pole sitter Dylan Burt finished fifth. Chris Williams and Joe Heffner got hooked together on the first lap of the UMP Bomber B Main after starting on the front row. That brought out a caution and forced the two drivers to start at the tail for a complete restart. Roscoe Stetten then became the pole sitter and maintained the lead for the first part of the race until a restart after a caution for Joe Cordes stopped automobile. Stetten led the field back to the green flag but had apparently cut a tire as he stepped on the gas. The rest of the field took evasive action to get by as Stetten limped back to the pits. Ron Leonard suddenly found himself with the lead in which he held all the way to the checkered flag for his first feature win of the year after starting 11th. Dave “Gumby” Golembiewski was second followed by Kevin Cole, Karl Spoores and Tim Mullendore. John Dryer was the early leader in the UMP Bomber C Main until getting held up slightly by the lapped car of Devin Goodman. Chris Sands took advantage and moved by into the lead. Tony Tolles started deep in the field and got into Dryer while trying to get to his inside battling for second. Dryer spun collecting Richard Riffe and Jamie Faller. Tolles continued his march to the front going to the inside of Sands for the lead on the final lap. Sands slipped up the banking in turn four as they came to the checkered flag, allowing Tolles to pick up the victory. Matt Lane finished second as Sands slipped back to finish third. Nathan Goodman and Brian McKenzie finished fourth and fifth respectively. The first ever UMP Late Model Push Truck Dual Features event is scheduled for Saturday, May 30 and will feature two complete UMP Late Model Features each paying $1500 to win. UMP Sportsmen, UMP Bombers and UMP Hornets will fill out the rest of the night’s racing line up. Regular admission prices will be in effect as they are each and every Saturday night at Oakshade Raceway. Gates open at 4pm with racing at 7pm.